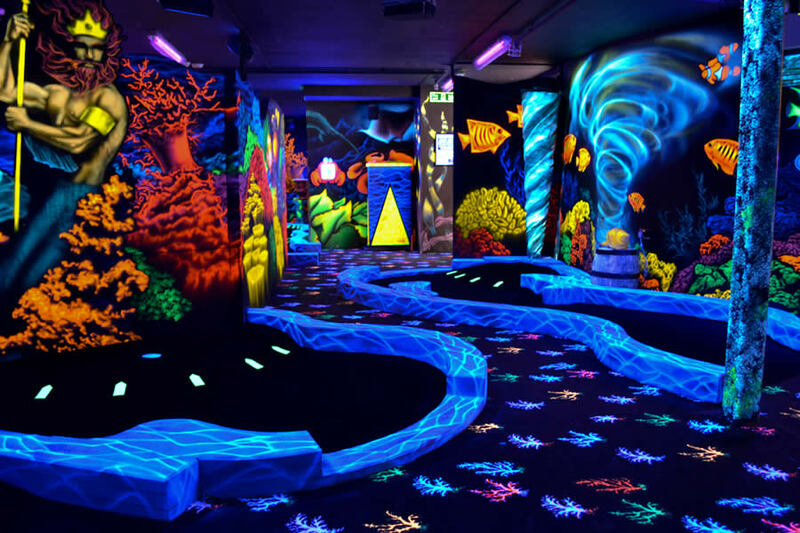 ,p>4D Golf - Mystery & Fantasy combine to create the UK s first Glow-in-the-Dark 3D Mini Golf adventure. Experience the latest craze to sweep America, right here in the UK. This classic family adventure has a whole new look. Xplore presents two heavily themed courses brought to life with ultra-violet light, strange sounds and special effects. Course 1 – ‘Search for Atlantis’ Legend has it that the sea god Poseidon himself protects the ancient underwater city. Explore the depths of the Ocean and encounter mermaids, sharks and strange creatures. 6 Hole mini-course… perfect for families and children. Course 2 – ‘The Mummy’s Curse’ After awakening the spirit of the Pharaoh you must journey through the ancient tomb to find the fountain of Egypt. Only here can you lift the terrible Mummy’s curse. 9 Holes for families and ‘bigger kids’! Offer entitles the card holder to one free entry ticket when a full-priced ticket is purchased. Valid for one free ticket only. Not available on group tickets or with any other offer, promotion or special event. Cannot be used for birthday parties. There may be queues at busy times.Not valid on published bank holidays. Not valid 24th October 2015 - 01st November 2015 inc. Offer expires 18th December 2015. See attraction’s website for opening times, prices, details and their Ts and Cs. All details correct at time of printing, but we suggest contacting attraction prior to visiting.